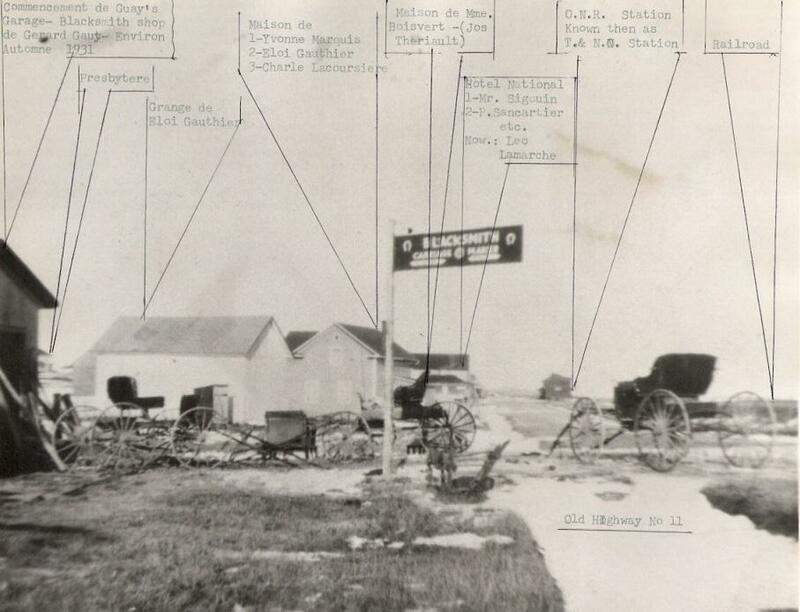 Before the automobile became popular, Gérard Guay openned a blacksmith shop to service the needs of the community. Back in those days, people travelled by horse or by rail. The first roads existed only as networks of trails, connecting communities. Eventually, Gérard found himself servicing more "horseless carriages" than the tradition horse and buggies. The future of transportation was changing. High-tech was the internal combustion engine. The association with the Ford Motor Company of Canada, began in 1939, when a Ford factory representative discovered Gérard's tallents and kindness. Above: Picture from 1931 of Val Gagné. Two original town buildings still remain today. ( Tavern & Rail Station ) Can see buggies in front of blacksmith shop. Above: Early years of Guay's Garage with White Rose gas. House at left. Above: Camille Guay in his younger days. Driver of the successful Guay's' Fireball. Dramatic races occurred in Timmins. Above: 1965 Currunt location & store. The move in 1955 to newly built Trans-Canada Highway proved to be a wise decision, despite much criticism of leaving the village of Val Gagné. The building sports red lettering and Texaco stars. Since Gérard's beginnings, family generations continue to offer great service and a friendly atmosphere. Today's technology is moving at a faster pace, and we are constantly keeping up with ongoing training and the latest diagnostic tools and support. 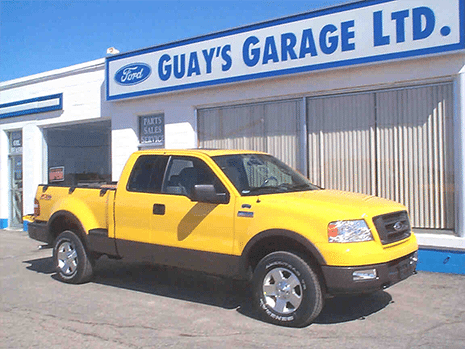 About Guay's Garage - Val Gagné,ON Area New & Used Ford Dealership serving Val Gagné. Guay's Garage offers many automotive products and services to our Val Gagné area customers. From quality new Ford vehicles to used cars, we know anyone looking for a vehicle near Val Gagné will likely find what they want at our dealership. We carry a comprehensive line of Ford vehicles, including the F-150, Escape, Explorer, and Edge making us a good choice as your Val Gagné Ford car dealer. Call Guay's Garage or come visit us in person. We're convenient to Val Gagné,ON and located at 4212 Highway 11. and look forward to helping you with your automotive needs. Stop by Guay's Garage for all your Ford service needs. Questions? Any of our knowledgeable service and sales people can help. Call 866-934-0794.